I like these guys from Minneapolis...wish You Tube had some clips of The Cows playing "El Shiksa". One of my favorites. This ABC song came to mind this morning. The Greek tragedy set to 80's synthesizers. Once again, art imitates my life minus all the percussionists (gentleman, is it necessary to have mammoth orchestra bass drums and assorted congas for a song that employs a single Casio SK-1 drum machine?) Anyway, the quick flash of the Coke advertisement at the end is good for sponsorship. Poison and Coke? A winning, refreshing combination! It was liberating to lose myself in this wistful reverie. "And then, we'll be able to talk without stumbling into those words that cause time to bleed." --Jo Bousquet. ...The heart of this collection is in the segment "Fever", when Emorine declares: "Only silence has the bedside manner needed to respond to words broken down by their plentitude." Carefree, AZ. Cave Creek, AZ. Sedona, AZ. Pure vortexes of energy in those stoic, wise rocks that have stood the test of time on the barren landscape. The vegetation--saguaro cacti, ocatillo, pricky pear. Javelinas cross the roadways. Cowpokes and Harley riders. The stretches of long desert miles. The constellation-filled sky--seeing Venus as bright as the sun. lost in the wine of night. "Como tembalaba el farolito de la calle!" Lyrics to 20+ year-old songs like Alison Moyet's "Invisible" (which stopped by the brain this morning) has redressed the idea that the subconscious does have a soundtrack and puts the needle to the proverbial life vinyl when an appropriate "groove" arises. My whole life, I've seen the world symbolically, through letters/characters, language/words, sounds/sights. It is amazing to me, when I observe waves that crash against rock, that I can process it to the point of feeling, for a moment, as if I am a wave. My reception to nature could further be tuned, but the frequency has at least registered. Between Moyet, REM, and the torrential and seemingly chilling waves this morning, I recall a conversation last night with a few writers about music's role or importance in finding a voice in writing. The poetic is fictional and fiction is poetic and reality is only word in the language that should always be used in quotes. "So here I am. Here I am." 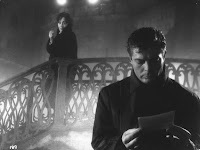 Le notti bianche (White Nights), directed by Italian neorealist Luchino Visconti, takes its title and basic plot from Fyodor Dostoevsky’s 1848 short story. In both the story and the film, a lonely young man meets a lonely young woman. Mario (Marcello Mastroianni) is lonely for social reasons; he is a stranger and a newcomer to town. Natalia (Maria Schell) is lonely because she has always lived in isolation, even in the heart of the city. Her loneliness is intensified because she is in love with a man (Jean Marais) who may not ever return to her, but who continues to occupy her heart to the exclusion of any other possible relationship. Mario thanks the young woman for the moment of happiness she has brought him. However, he is left alone at the end of the film, befriending the same stray dog he met at the beginning. He is back at square one, and has put more energy into pursuing the fantasy of an obsession rather than any prospect of real love.